Does Tom Cotton have some hold over Senator Chuck Schumer? It must be that Senator Tom Cotton from Arkansas has some sort of magic hols on Senate Minority Leader Chuck Schumer. Whatever the reason, Senator Schumer refused to negotiate because Senator Cotton was present. What sort of Grammer School behavior is this? It is more likely the Schumer was looking for any reason for negotiations to be stalled and Senator Cotton was all the excuse he needed. Schumer may have thought that Cotton got Trump to change his mind about parts of the deal but Cotton was nt around to talk to the President. You can guess that the president figured out the bill of goods all by himself. Sen. Tom Cotton’s (R-AR) strong influence over the national debate on immigration policy and President Trump’s administration has left Senate Minority Leader Chuck Schumer (D-NY) unwilling to broker an immigration deal unless the populist conservative Senator is left out of the conversation. A POLITICO report revealed the level to which Cotton and his close ally Sen. David Perdue (R-GA) — both staunch pro-American immigration reformers who want to see legal immigration levels reduced to benefit American workers — have gotten under the skin of Schumer and Democrats. 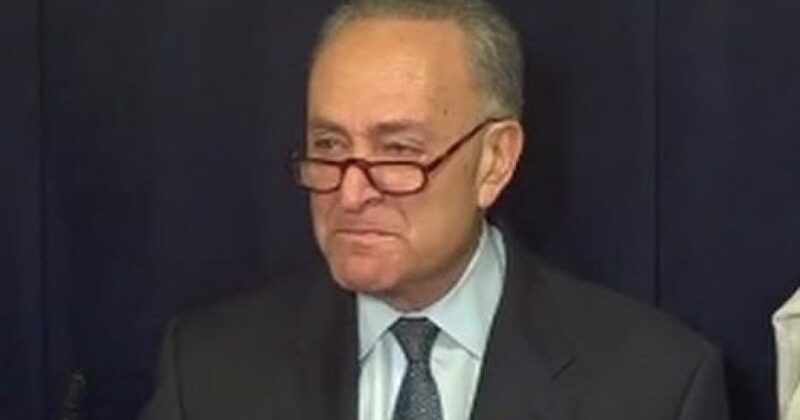 When it comes to striking a deal between the Republican establishment, the “America First” wing of the Republican Party, Democrats, and the Trump administration on the issue of nearly 800,000 illegal aliens who have been shielded from deportation by the President Obama-created Deferred Action for Childhood Arrivals (DACA) program, Schumer allegedly told the president that he will not negotiate a deal if Cotton is involved.